Man have I been missing out. 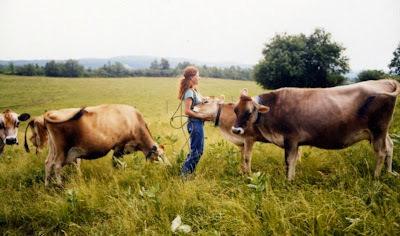 Here's a fascinating article about a woman named Diane St Clair who runs a small farm in Vermont. She hand-produces butter for certain select chefs at high-end restaurants. And the price of the butter? A staggering $49/pound!! The funny thing is how astounded the writers of the article are about the process of hand-making butter. I mean wow -- this butter is RARE AND PRECIOUS because Ms. St Clair milks JERSEY COWS then HAND-CHURNS the cream then KNEADS IT BY HAND to WORK THE FATS (actually, the hand-kneading is to extract the buttermilk so the butter doesn't go rancid). She "produces just 100 lbs of butter a week, ten months of the year, making the product EXTREMELY RARE AND PRECIOUS." Um, how do I tell these reporters that hand-made butter is in rural areas is pretty common? I can list at least five other people (besides us) who make their own butter. By hand. Usually from Jersey cows. And that's just in our little neck of the woods. It's really not that big a deal. However I genuinely admire the entrepreneurial Ms. St Clair for marketing her butter to upscale consumers. I'm serious -- my hat is off to her for realizing there's a market for "rare and precious" butter. Kinda wish I'd thought of it first (although there are certainly enough upscale consumers that there's room for competition, I suppose). Besides, anyone who cares for her critters as much as she clearly does has my deepest admiration. This is the kind of relationship homesteaders and their livestock so often have -- gentle care and genuine fondness. Good for her. Oh my...and here all this time I could have been a butter millionaire! Kudos to her for finding her market. Although I do have to add a wry chuckle: how long until her local Health Department coes a callin' to inform her that her production methods (kneading by hand) are unsanitary, therefore demanding that she get her entire operation up to code, pay fines and fees, etc.? Only a matter of time, I am sure. Wow is all I can say. I think you can make butter in a mason jar, at least it was experiment for a girl scout troop. Gee, they could have sold it and made more money than selling cookies!! I always love how things that are upscale translate down to people who are just trying to get by or trying to do things themselves and completely skip the middle group as being either to high or low brow. Like eating deer, duck, or rabbit. You generally see it either as a fine dining thing or as a backwoods thing but not really in the middle sector of our society where it could do some real good. That's $196,000 annually... for butter!! What a great entrepreneurial spirit! These days it seems the basic ignorance of some groups is matched only by their arrogance. Patrice: I'd like to email you but the one listed on your website kicks back. Could you give me your correct email? Thank you. I sell eggs to a gal who pays me $4.00 a dozen when all I ask for them is $2.50. Guess who gets all my excess eggs in the winter when the gals don't give me many eggs? :) She values my eggs because they are fresh, farm raised eggs and if she buys them at the health food market she pays $4.00. I admire her that she pays me what she pays for them at the market when she could get by with a lower price from me. I love her for that. our church used to make perogies all the time and sell them for about 2.50 per dozen 30 years ago. a parishioner who worked for a lawyer brought us a high end christmas catalog from his mail. i cannot remember the outrageous price for half a dozen perogies in that catalog, but they were listed as ukrainian gourmet food. we decided we must be selling in the wrong market [rural pennsylvania]. hahahahaha....everytime i think of this i cannot help but have a good belly laugh...the gal with the butter for sale is one helluva marketer and her customers have absolutely no clue. Oh sure, like we're supposed to believe that butter comes from actual cows? Everybody knows that butter is made at the butter-making place. And then it goes on a truck. Talk about a cash cow!! ha! I went to her site,she has the healthiest Jerseys I have seen since I left the small farms in Kentucky. Their weight is absolutely perfect, their udders perfect size, their eyes soft and clear. I bet she can sell the heifer calves at a premium. Yes, that is a crazy price for butter, but have you read thru her cookbook? I love the many uses of buttermilk and as common on any farm, sometimes we need suggestions on what to do with the excess. I'm always swimming in goat's milk and eggs in the spring. Have a Merry Christmas! Reading this story reminded me of the movie Baby Boom with Diane Keaton that made plain ole apple sauce for her inherited baby a multi million dollar success. Now that is using your noggin. Although we squeezed in chickens pigs and sheep there is no way this half acre lot could handle a cow. I would love to find a home grown source for milk and butter. It is harder to find than you would think. All of you with milking cows should market excess products to your neighbors, we are out here. Still not paying $49 a pound though! Wow, who would have thought? $49/lb! We are sitting on a gold mine! We have about 200# of our homemade butter from our beautiful Jersey in the freezer. I milk my cow by hand, we skim the cream by hand and shake it in quart jars and then work it out by hand (wooden spoon actually) then weigh, wrap, label and freeze it. Once frozen, I vacuum seal them and place them back in the freezer. We fill the quart jars about 2/3 full and get between 7 and 9 ounces of butter per jar.